Length of Program 5 X 90 minute pre-live recorded activations & Additional Channelled PDF for support. This program was recorded live from activation portals of Hawaii, Canada, Vancouver Island & Mount Shasta. Intended to be used over a 5 week period, leaving 3 months for full integration of the activations. You may listen to each recording as many times as you are guided to continue deepening your connection to the crystalline grid and your ascending hearts. Using her gifts as a Crystalline Grid Activator, Zoe will guide you to step into the dimensional experience most aligned with your heart’s desire – that of the 5th dimensional frequencies and learning how to anchor this light into your daily physical lives. 5 EXPANDING ACTIVATIONS OF LOVE, SUPPORT AND ABUNDANT ALIGNMENT! The Crystalline grid houses our complete potential to live presently, live with joy, live with love, live with harmony, live with compassion, live with integrity. Resonating with our higher selves. Intention setting, activating meditations, ground in the light codes, call and embody our higher selves to help clear, transmute and anchor our new awareness into the crystalline grid. Ascension alignment integration, light code and sound code activation. Core healing of emotional and karmic wounds to remove old blockages, limiting beliefs and programming and replace them with new language and light codes to accelerate your timeline into ascension into 5-d and beyond. Channeled messages from the collective consciousness of light, the elementals, angels and guides. If this resonates with you – if this speaks to your soul – trust – trust in the process that you are meant to receive the frequency within these activations and step into the unknown of your crystalline creative potential. This live recorded workshop dives deeper into the potential of crystals. We learn how their activations can support us with our own ascending crystalline light bodies and accelerate potential timelines of reality. So much has shifted energetically since 2012 and now the crystalline grid is fully functional – so too are the power of crystals coming back into play. They have so much to teach us energetically and through their own LIGHT codes we can truly harness the potential of 5th dimensional living and above. How does this relate on a human scale?, Building grids and activating crystals with different intentions opens portals within their being to download more concentrated light source which amplifies and expands on the intended outcome. Learn how to open & activate crystals for different purposes – abundance, healing and more. Channelled messages from the collective crystal kingdom. Crystal grid creation & how to open, activate for expanded intentions. Love is the answer – a guide to awakening the heart and stepping into true authenticity. It is ok if you have never done a meditation before, it is ok if you do not know what to expect from reading this book. It is ok if you are not already there yet or feel 100% love in your hearts, it is all ok. It is ok if you find change difficult, it is ok if you find fear a challenge, it is ok if you are hurting, it is all ok. This book reminds us of the love we are capable of through breaking down the false sense of self – ego, fears and limitations. This is an energy book, not a thinking book, designed to gently assist you on your continued journey of living with an awakened heart. Each chapter brings a renewed awareness that love is within you the whole time. Through daily meditations, affirmations, and journaling- you may step back into the truth of who you are to always follow your own heart, intuition and authenticity. This is my truth, and a gift of love to help guide you on a journey back to your hearts and back into alignment with your souls. Move through the linear timeline – A live recorded 90-minute activation to accelerate your manifesting potential and ground into the higher frequencies. This online class is a 90 minute activation and additional channelled support to expand your energies ready to receive more. Great for those moments when you feel stuck or not sure what the next steps are. These live masterclasses are held monthly so you get to join us for the month you sign up. 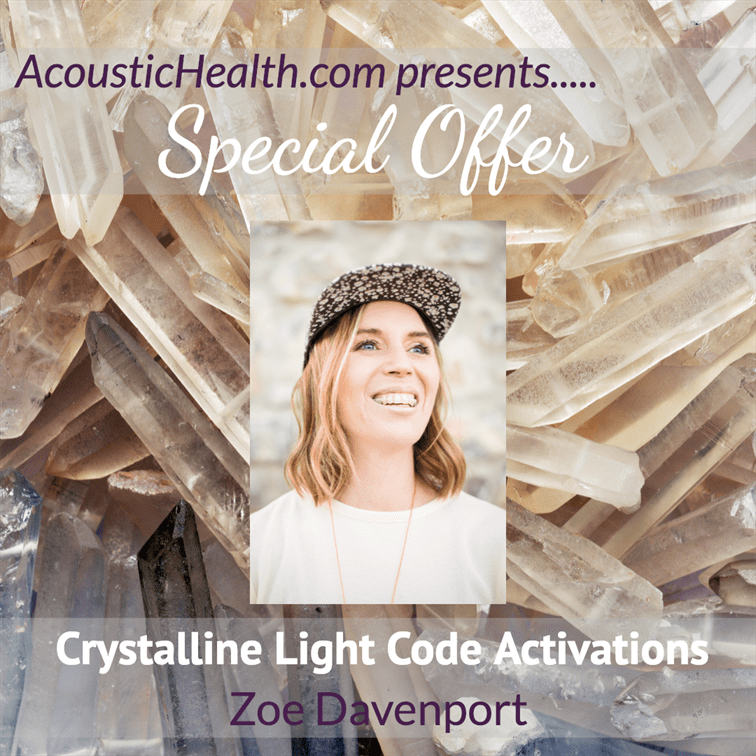 “I participated in Zoe’s 5 week crystalline activation program, including a 1 hour private session in May 2017. From the very first activation I experienced Zoe holding beautiful loving space for the group, and waves of energy coming in. By the end of the call I was full to the brim with gorgeous, vibrant, expansive energy and I could feel a visceral change in my body. So much so I was struggling to drive after! Each week there was a lovely new activation experience with an injection of energy which helped me feel more consistently upgraded, expanded and in joy. “Taking part of Zoe’s 5 week Activation program has been the best self-care I could have ever given to myself. Coming into it just feeling the call to attend and knowing pretty much nothing about Zoe or the program, I’m left with overwhelming feelings of expansion, spiritual growth, love and gratefulness. “My experience with Zoe’s crystalline grid workshop was phenomenal to say the least. I experienced closure to many many things from my past which came to me in dreams following each of the workshop live calls. I had experienced nightmares for 40 years regarding a past trauma and in one of my dreams following an ascension call I came to terms with what happened and so my nightmares have stopped. This just blew my mind and was so astounding to me. “I was introduced to Zoe from a friend and started with some heart opening meditations. It blew my mind. When I read her book “love is the answer” I felt like I could completely relate in so many ways. So then years later I stumbled upon this Crystalline Activation group and my whole being said yes. Recently I became very drawn to these gem stones and couldn’t figure out why. My higher self guided me straight into Zoe’s line of heart fire. The flow of synchronicities that led me to her were very powerful and in my face, and so I decided to follow my heart’s guidance and sign up. Just finding her was a miracle. The first week alone was incrediblyy shifting as my energies adjusted to these higher frequencies that are natural flowing, as I powerfully adjusted with such a gentle yet powerful alignment activation deep within my being. Everything that wasn’t in alignment with my soul magically dissolved so quickly. Zoe’s countenance/essence/energy and embodiment of pure divine heart space is a multi-dimensional tune-up that occurs on many dimensions not just the physical…. but also very much the physical. I am able to see all the ways I was choosing against myself and operating from a place of fear. I am tolerating a life where I keep my head down, work hard, suffer, and then suffer some more which is exactly what I am here to help the world recognize and shift. Working with Zoe, she calls in the highest beings and her light encoded voice is so powerfully activating, and soul comforting and felt in such a harmonious/resonant way that immediately aligns every cell, infusing with light and then organize them to work together. The light language penetrates on a vibrational level that also makes it easier to let go and heal on every level of being/consciousness/physicality. I am enjoying the journey and it is definitely the opposite way my ego would lead me -in a comfort zone rut that leads nowhere… and this is precisely why my higher self appointed Zoe to appear in my world as a guide, and support as I allow myself the divine feminine space to receive and simply BE who I am – without apology, guilt, shame, and doubting who I am which is magnificently joyful and powerful and here to impact billions of souls on the planet at this time of great shifting. Not for the meek, to work with Zoe you have to be READY to play and also face your darkest shadows, but the reward is far brighter than any shadow on the wall… It is time to start enjoying the ascension journey opening to MORE, always expanding, always brightening, alway changing. We are here to live in JOY, abundance, freedom, peace and pure bliss and really here to help one another and the earth as guardians. Zoe is a beautiful divine support, sister and Light on this planet who truly understands what it is to be human and divine being and how to navigate through releasing the old stories and allowing the new. She comes from a place of wisdom and surrender that is wonderful to align with; she is dedicated as a way shower by BEING and embodying an open state of Love in order to be able to simply align with it within ourselves. It’s a magnificent honor to have the opportunity to experience this level of accelerated heart expansion, especially since I have deep soul connections with Glastonbury. I know this is just the beginning of my life living with an open heart as I step into my full power. Zoe will help you stop playing small and trust the sacred meaning of your life and how easy it is to find your way into creating with your heart rather than blocking your own blessings and infinite support from source.